UPDATE: Pizzaville Barrie South is going to donate free pizzas for donors every Tuesday & Thursday afternoon! Yahoo, the power of the pen! I’ve written before about the precious substance that’s within you to recycle: your blood. The need remains great; just turn the pages of this newspaper or turn on the TV to see examples of people in bad accidents, or needing special surgery, who must have blood transfusions to survive. The greatest barrier to maintaining sufficient blood supplies isn’t really supply, of course – if each eligible person gave every 2 months, they’d have to start turning people away! But that’s sadly not the case. The last time I was at the Barrie clinic at Bayview & Little, there wasn’t even a line-up and I was processed through right away. Clearly there is capacity for more donors, and every pint donated means one less that must be purchased from some other jurisdiction, at cost to our already overburdened health care system. That's-a one bloody good-a pizza pie! But that brings me to another donation needed at Canadian Blood Services’ Barrie Clinic – pizza! Part of what made it easy to bring my daughters to the clinic was the slice of fresh pizza offered after a donation. Sadly, though, the clinic has had to cut their pizza budget, and will have to rely on donations to keep donors fed with something hot & fresh. Barrie-headquartered Topper’s Pizza donates pizza at lunch time each Thursday, which is greatly appreciated, and aligns well with their year-round support for SickKids Foundation. But that leaves a pizza gap for the Tuesday & Thursday afternoon/evening hours, for people who can’t donate in the mid-day. Do you think another Barrie pizza outlet might step up to fill in the gap, delivering some fresh pizza each Tuesday or Thursday afternoon around 4:30? I bet they will, if you help! Find the Facebook or Twitter account of your favourite local pizza outlet and post a link to this article, or clip it out and bring it in to the counter, and let them know that you’d be thrilled if their bloody delicious pies were available to replenish the spirits – and nutrients – of Barrie’s blood donors. I’m sure if you do, then they’ll listen to you and step up to do their part for those in need. Any pizza place willing to help the community this way can contact Julie Rose at Canadian Blood Services at (705) 792-2566 or Julie.Rose@blood.ca. Give blood, give pizza, either way – give! Have you ever heard of a “food forest”? Is that something like Big Rock Candy Mountain? No, rather than a fairy tale, it’s a real thing. It’s food-producing trees and plants on public land – kind of like an orchard or garden, but free for citizens to access. And Barrie is starting on the path to having food forests right here, in partnership with FruitShare! When the City of Barrie had plans to plant trees on public land as part of its reforestation efforts, FruitShare saw it as an opportunity to feed the hungry. Rather than only plant typical native tree species, the City agreed to include some fruit-bearing trees. A dozen now make up Barrie’s first urban fruit forest. Residents will soon be able to enjoy picking fresh apples, peaches, pears and cherries free of charge. In the unlikely event that fruit goes unpicked, FruitShare will harvest and split it between FruitShare volunteers and the Barrie Food Bank. The City wisely recognizes that urban forest cover provides many benefits, including water retention, improved air quality, mitigating climate change and habitat for wildlife. Now there’s the added benefit of providing free food for Barrie residents for years to come. Barrie’s urban fruit forest is the first step in the partnership between the City of Barrie and FruitShare. Next is the development of an Urban Forest Management Plan for Barrie, including a food component, with possible expansion to other public lands or right-of-ways. While the idea is in the earliest stages here in Barrie, further progress has been made in cities like Seattle, Washington, where the Beacon Food Forest is shaping up to be a 7-acre integrated project including an edible arboretum, a berry patch, a nut grove, a community garden, plus gathering and play areas. Certainly we’ll monitor their success for ideas on how to better manage our own public food resources. This all hearkens back to the idea of “the Commons” – land belonging to the community, free for all to use and share without having to pay rent. Sadly, over the years, most commons were enclosed and appropriated for private use and profit. Nowadays the commons mainly just exists for recreational uses – parks, trails, and beaches. But in prior times, the commons was a vital part of the food production system, providing fruit and other wild crops, herbs, and medicines, as well as grazing space for livestock and fuel for fires. It recognized the ancient principle that the earth was given to all to share, including land and the fruits of nature, but the things people planted, harvested, built or improved became their own, as long as they left enough for others to also provide for themselves. Perhaps initiatives like food forests can help bring back that earth-sharing ethic. FruitShare is a local not-for-profit bringing volunteers to harvest otherwise wasted fruit from residential trees. This rescued fruit is then divided between home owner, volunteer pickers and the Barrie Food Bank. There are many ways to get involved, such as volunteering to pick, sharing your fruit tree, or providing donations to FruitShare. Please call us at 705-715-2255, email FruitShare.Barrie@gmail.com or visit www.FruitShareBarrie.ca. Published as my Root Issues column in the Barrie Examiner as "Barrie paving the path to food forests". Thank you to FruitShare coordinator Jenna Zardo for her contributions to this article. Imagine you’re in a shipwreck, you find a piece of wreckage and float, adrift, for weeks on end. Finally, almost dead from sunburn, starvation and thirst, you wash up near a tropical island. A person pulls you in and nurses you back to health, and you learn she survived the same shipwreck, but landed on the island right away, learning to live (and live well) off nature. Back on your feet, your rescuer asks only that you help rebuild the roof she neglected while caring for you, replace the paddle she lost rescuing you, and gather some extra food to make up for what you ate. It takes a few weeks to manage all that, but it’s only fair, and from then on, you often exchange products of each other’s labour. You share evenly the bounty of the island, which is more than enough for both, but pay each other for anything you make using your own skills or efforts. While she fishes, you gather roots, and exchange some of your bounty for some of hers; you trade beams you craft from fallen trees for roofing she weaves from leaves so you can each have shelter from the sun, rain and wind. The RENT is TOO DAMN HIGH, Wilson! But what if the first castaway had told you she had claimed the island, and you would have to pay to live there? She demanded tribute when you gathered roots or coconuts, or to made a boat from fallen wood and vines so you could fish. And if you didn’t pay, she’d drive you off the island with the wild dog she’d found and trained. So while you toiled to gather enough food to feed yourself and pay her rent, she could relax and live off your hard work. That hardly seems fair, yet it’s our economic system now. There are more people involved, a wider variety of lands and resources, but the principle remains that some demand a price for monopolizing things they don’t create, the products of nature or community, which others must pay out of their own labours. But we can do better. In his book Progress and Poverty, Henry George described how we could fairly share the rent of land, keeping the products of our own labour, and advance together as we are rewarded for our work, not penalized in a cycle of landless poverty. These concepts are similar to many indigenous ideas about property, but can also be adapted to complex, money-based economies like ours. We just must realize that we deserve to keep our earned income, while unearned income must be equitably shared. Separated by 135 years but joined by common values, George’s and Gaffney’s books point the way. Publishes as my Root Issues column in the Barrie Examiner. Thank you, thank you, thank you to all of the supporters of my Climate Reality Leadership Corps training which took place one year ago. Thanks to your gifts, I was able to give the time to attend the intensive 3-day training in Chicago given by Vice President Al Gore, and to give the time to share his Climate Reality presentation in our community. I am happy to announce that, between online crowdfunding of $870 (minus fees) from 12 donors and a $1000 bursary from Barrie environmental charity Living Green, I was able to cover the full cost of travel, accommodations, and meals with some funds left over to cover costs of making presentations. (For example, I had to purchase a newer laptop to be able to properly display the videos in the presentation). 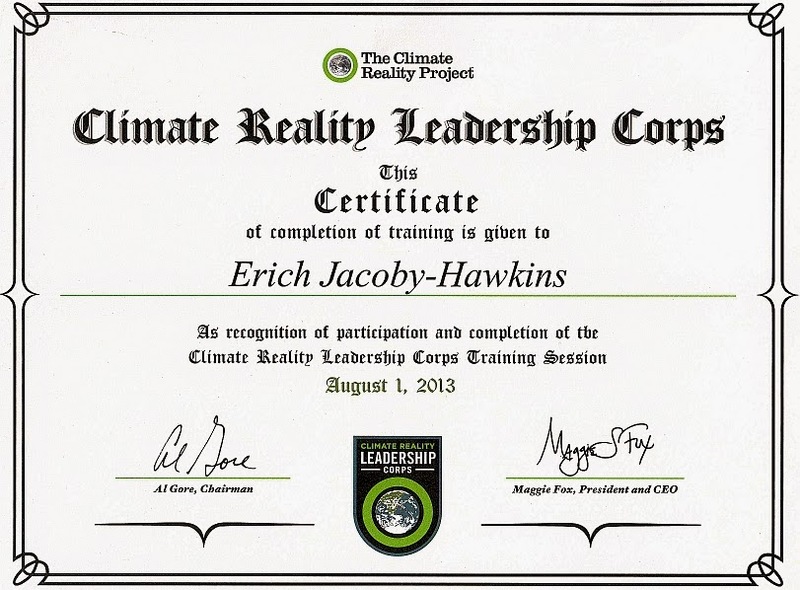 As part of the training package, I committed to ten "Acts of Leadership" over the following year, which include Climate Reality presentations to members of the public, writing articles for the newspaper, or doing other activities to raise awareness of the Reality of Climate Change. I am registered as a presenter at the Climate Reality Canada website. I have also been writing about Climate Reality in my weekly "Root Issues" newspaper column in the Barrie Examiner. I am proud to report that I have met and surpassed my ten-Act commitment, by giving four live presentations, sitting on a film panel for leadnow.ca Alliston, and publishing ten columns about climate change in the Barrie Examiner. However, I am still interested in helping spread the word about Climate Reality, just as you helped me, so feel free to contact me directly or send people to the website to request a presentation. Once again, thank you to all of you for your support. It's so much easier to accomplish great things when we work together as a team!